The game has a built-in level editor. Source code was released in public domain in 1997, allowing 3rd party ports and modifications. A shareware version is available. 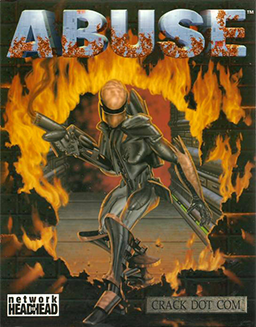 Abuse SDL is an updated version of the game ported to SDL2, it allows for modern OS support, higher resolutions, gamepad support, and a multitude of bug fixes and enhancements. Note that there is no support for multiplayer. For Windows, everything is provided in a single download. For OS X and Linux, the source code for the port needs to be downloaded and compiled. A standalone fan made single player campaign based on the shareware release. Contains levels and assets from the shareware version, as well as fan made assets and over 20 levels. Download available here. Use Abuse SDL. On by default. Can be toggled using F10. Use Abuse SDL. See Borderless fullscreen windowed. Use Abuse SDL. See Vertical sync (Vsync). Use Abuse SDL. Note that the game was designed to run at 15 FPS. As such, Abuse SDL by default sets the physics update speed to 65 ms (or 15 FPS) to prevent it from breaking. Use Abuse SDL. See the note above. Change the value of fullscreen from 0 to 1. Save the changes made and launch the game. Change the value of vsync from 0 to 1. Use Abuse SDL. See Remapping. Use Abuse SDL for XInput support. Can be toggled using F8. Use Abuse SDL. See Controller remapping. Use Abuse SDL. See Controller sensitivity. Under the ; Key mappings header, change the values of the commands to the desired key(s). A list of special keys available can be found in the included README.txt file. Under the ; Button mappings header, change the values of the commands to the desired button(s). A list of of the button names to be used can be found in the included README.txt file in <path-to-game>. Change the value of ctr_rst_s to the desired sensitivity. A source port is required. See Abuse SDL. This page was last edited on 22 July 2018, at 11:57.